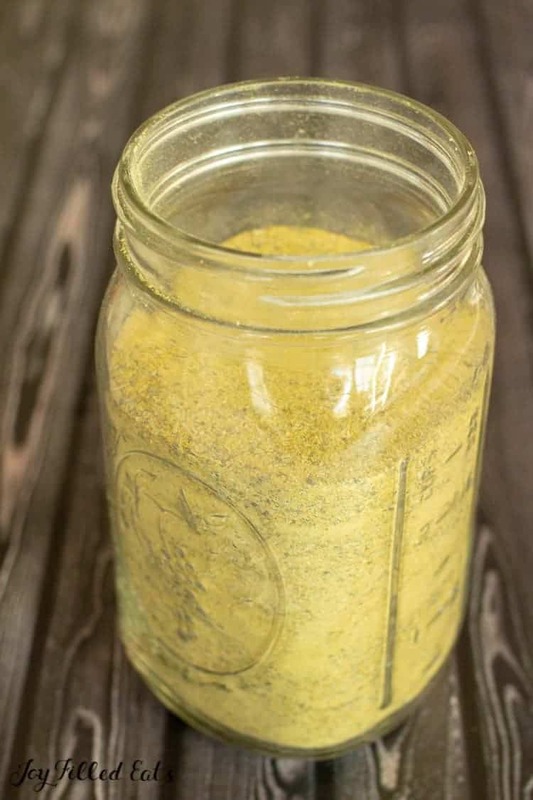 When you are in a pinch or just want a healthy chicken broth substitute this Chicken Bouillon Powder is the ideal staple to keep in the pantry! It is easy to make, keeps for months, and has more flavor than store bought stock. The first time I tried nutritional yeast I couldn’t believe how much flavor it had and how much it tasted like chicken broth. It was uncanny! If you haven’t tried it before you’ll be pleasantly surprised. 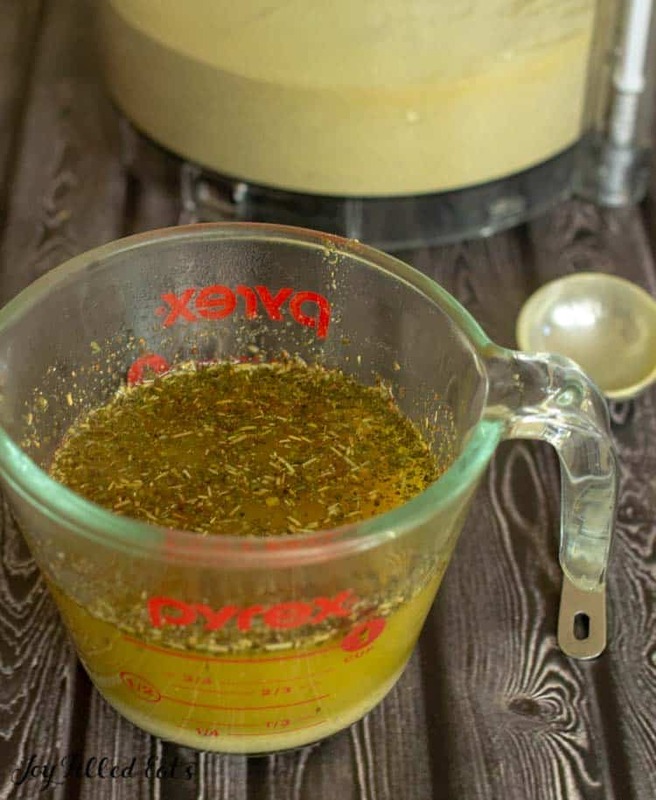 Over the last few weeks, I’ve been testing this natural chicken broth substitute in all the recipes I’d normally use bouillon paste or chicken broth. It works amazingly well! Last night was one of those nights I was in the kitchen at 5 wondering what on earth I was going to cook for dinner. All of the meat in the house was frozen and my husband was stopping home to pick up a few of the kids for dental check-ups so he wouldn’t be around to help. Thank God for the invention of the electric pressure cooker! I pulled out the Instant Pot, filled it with frozen chicken thighs, and turned to manual high for 15 minutes. Then I sat down to nurse the toddler who promptly fell asleep on my lap. I heard the Instant Pot beep in the other room at some point but just stayed with my little one enjoying the time with my feet up while I did a little early Christmas shopping via Amazon. When the baby woke up I took the chicken out of the Instant Pot, added some of this chicken broth powder to the cooking liquid, threw in some baby spinach, and then add back half the chicken (now shredded). The family had the choice between chicken soup and using the rest of the shredded chicken for tacos. Considering all the soup had in it was cooked chicken, spinach, and this bouillon powder it was delicious. My husband raved about it. 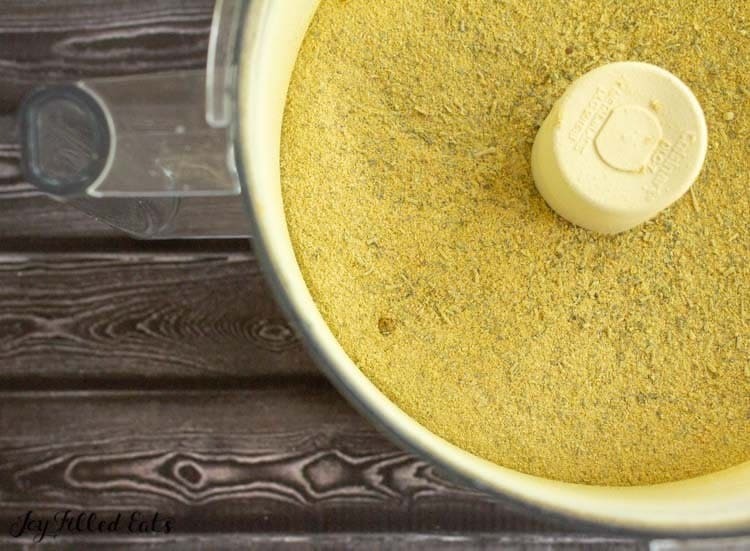 To make bouillon powder you just need some herbs and seasonings, salt, and a nifty ingredient called nutritional yeast. 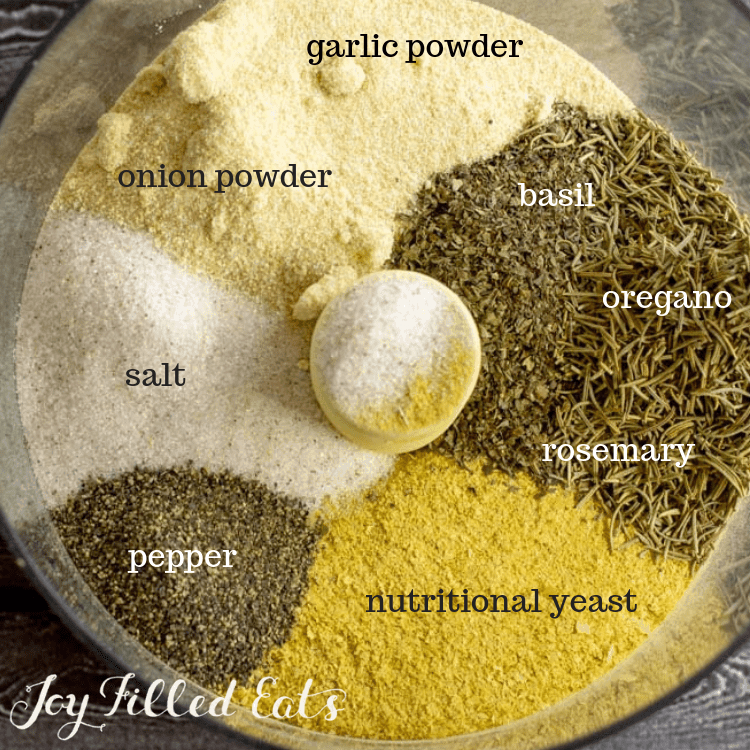 You add all of these to a food processor and blender and blend until you have a fine powder. 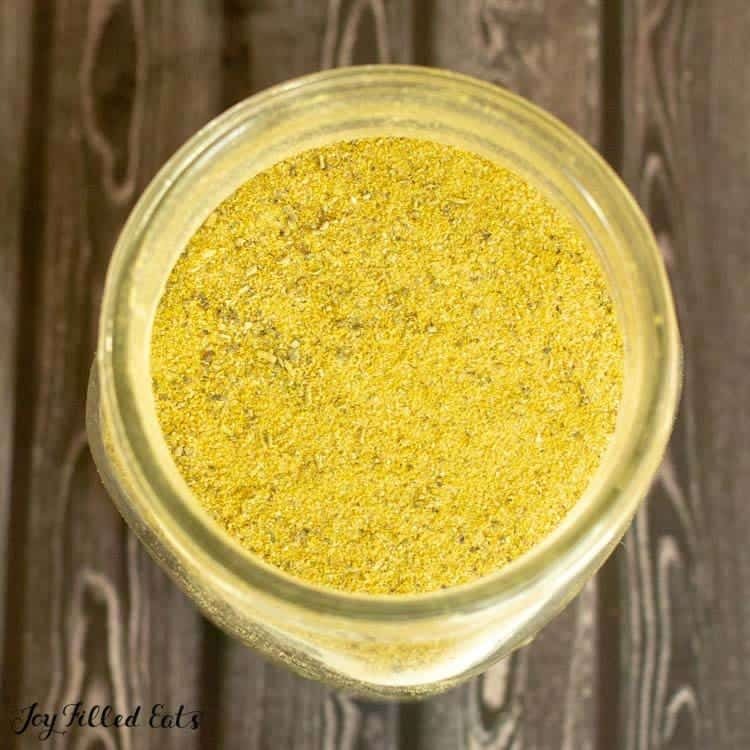 Nutritional yeast is an excellent source of vitamins, minerals, and protein. My mom is a vegetarian and can have trouble getting enough protein in. 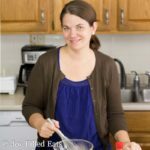 This is an easy way she can add a little non-animal protein to her foods. There are dozens of common herbs that taste nice in a chicken broth. You’ll find Rosemary Chicken Soup, Tarragon Chicken Soup, Chicken Soup with Thyme, and dozens of other recipes if you search for them. I used three of my family’s favorite herbs in this chicken broth substitute: rosemary, oregano, and basil. These are all found easily in any grocery store and are generally inexpensive. They give a nice herby taste to the broth when you make it. Once you’ve made bouillon powder it just takes a few seconds to turn it into a broth. Simple stir some into hot water. The amount you will want will vary on how you are going to use the broth and your own taste buds. My first few tries at figuring out the ratio of powder to water made a broth that was way too salty. I cut back on the bouillon powder and it was perfect. Combine all the ingredients in a food processor or blender. Blend until it is a fine powder. *** if you prefer a low sodium broth you can reduce the salt in this recipe to 1/4 cup or less. This is such a welcome addition to my recipe collection, thank you! 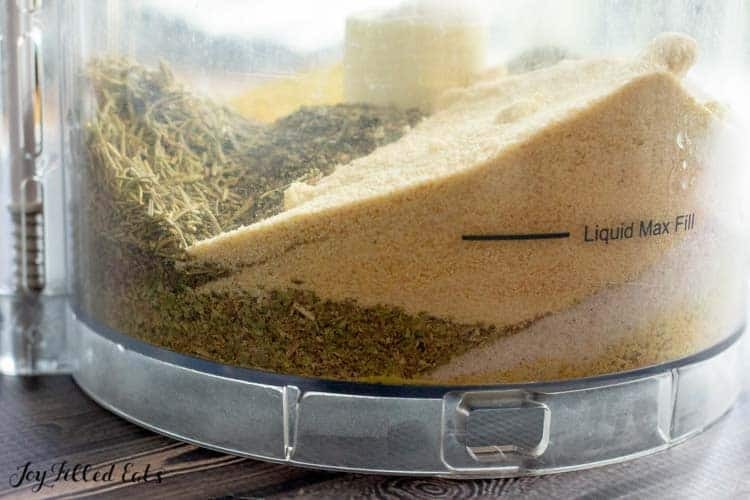 For this wondering about flavour additions when reducing onion and garlic, you might consider using the dried and powdered leaves from the tops of celery. I always dry them and have them on hand when celery is to pricey. Celery produces natural nitrates, so if you completely avoid nitrates you probably won't want to use it, but otherwise it's a great addition. This was so helpful! I am trying the keto diet and most chicken broths have keto unfriendly ingredients. I really appreciate being able to easily scale the recipe ingredients based on the number of needed portions. Thanks for sharing. I am glad to find an alternative to the store bought bouillon because all of them have significant amount of MSG. I am going to give this a try. I don't tolerate onion and garlic very well. I'm always on a mission for soup broth that doesn't kill me, and I've been intrigued by making my own. If I reduced the onion and garlic significantly, do you have any suggestions on what to up to keep the flavour? Or what to add in? If i just reduced it, would it kill it? Thanks! You could reduce the garlic and onion and increase the herbs. If you are ok with pepper I'd add a little more of that. Paprika might be nice too.